Do not attempt catching pigeons using nets or other equipment when standing on a ladder; this is risky and can result in serious injury. Approaching a flock of captive pigeons at night can cause them to panic and crash into walls and each other as they attempt to escape. This causes injuries and the bird you're trying to catch may be lost in the confusion. Don't catch feral pigeons for pets. They won't adjust well to captivity and will not "home" to your loft. They also startle easily and could cause an accident if you approach them while standing on a ladder. Pigeons cannot harm humans and handling them will not transmit disease. Contact a professional animal removal service for controlling feral pigeons. Lure domestic pigeons with pigeon food. Taming pet pigeons and using a clicker or signal when feeding them simplifies catching them. Don't waste time or risk injury by "baiting" a nesting bird to defend itself. 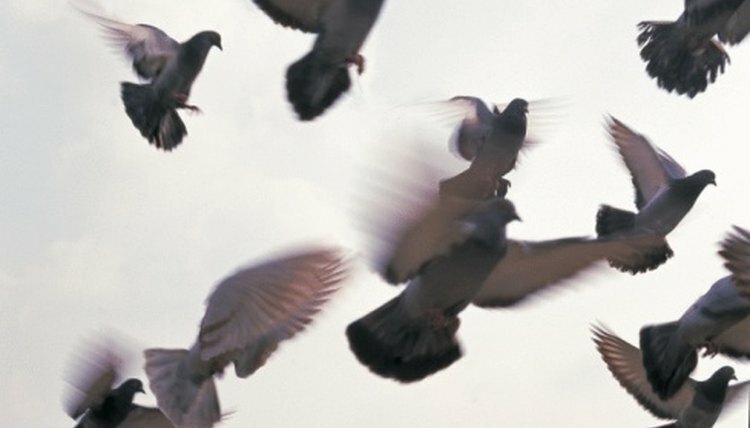 Your goal is catching pigeons without harming them or risking injury. Pigeons have excellent eyesight and flying ability, but are reluctant to fly in the dark. Whether catching escaped pigeons or catching captive pigeons, they can easily be captured at night. Nesting pigeons will guard their nests and young and attempt to scare you away by pecking and slapping your hands with their wings. Locate the roosting or nesting place of the pigeons you want to catch. Wait until nightfall. Eliminate all or most artificial lighting near the pigeons, but be mindful of your safety. Wear lightweight gloves for handling the birds, if necessary. Position your ladder if the pigeons are in a high location. Keep as quiet as possible to avoid startling the birds. Climb the ladder quickly but safely. Locate the pigeon you want and clasp it in your hands with its wings pressed against its body. Hold the bird firmly, but not tightly. Hold the pigeon against your body and descend the ladder. Place the pigeon in the pet carrier or cage. Cover a wire cage with a towel or blanket to settle the pigeon. Repeat this process for catching additional pigeons. Catch captive pigeons in a coop or loft using a similar technique. Pigeons establish favorite roosts and nesting areas. Observe your birds in their loft and identify where particular pigeons settle for the night. Transport captured pigeons to their destination as quickly as possible to avoid injuring them. Do not overcrowd the pet carrier or cage as the pigeons may fight.